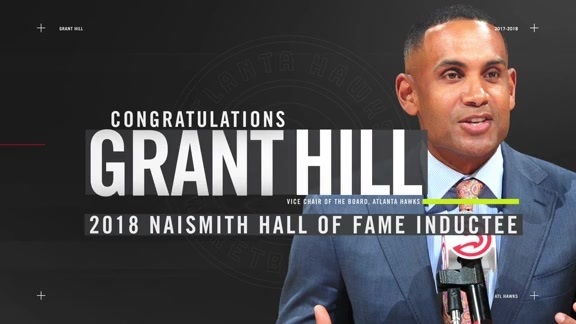 ATLANTA -- Former NBA superstar and current Atlanta Hawks Vice Chair Grant Hill had a long journey leading up to his Friday induction into the Naismith Memorial Basketball Hall of Fame. When Major League Baseball catcher Carlton Fisk was inducted into baseball's Hall of Fame, he said, "It's not what you achieve, it's what you overcome. That's what defines your career." For Hill, who scored 17,137 career points as a member of the Detroit Pistons, Orlando Magic, Phoenix Suns, and Los Angeles Clippers, that saying rung true on the night when he received basketball's highest honor for career accomplishment. Hill ascended to stardom at Duke University with three NCAA Final Four appearances and two national championships. After entering the NBA with the Detroit Pistons, Hill earned five All-Star Game berths in six seasons as he wowed fans with his smooth style and stellar all-around play. But Hill's path got bumpier when ankle injuries limited him to just 135 games over the next six seasons. Hill overcame those obstacles and clinched his Hall of Fame membership with a rebirth as a key member of the Suns teams of the late 2000s and early 2010s, who were made most famous by their Seven-Seconds-Or-Less offense. He even played all 82 games of the regular season for the first time in the 2008-09 season. "I'd like to say how amazing my basketball adventure has been and still is to this day," Hill said in his induction speech. "Yes, at times it has been fraught with challenges and experiences that have forced me to grow in ways that I could never imagine. You see, the game, it teaches you about life: about commitment, perseverance, co-exiting with others, handling success, dealing with failure. It will challenge you. It will encourage you. And if you're lucky, it will reward you too." In addition to Hill, the Basketball Hall of Fame inducted two-time NBA champ Ray Allen, four-time All-Star Maurice Cheeks, 10-time NBA All-Star Jason Kidd, two-time MVP Steve Nash, three-time Olympic gold medalist Katie Smith, four-time WNBA Champion Tina Thompson, and Charles “Lefty” Driesell, who won 786 games as an NCAA head coach. As is the custom, each inductee chose previously-inducted Basketball Hall of Fame members to present them at the ceremony. Hill selected Isiah Thomas, Mike Krzyzewski, Patrick Ewing, and Alonzo Mourning. Hill, the first former member of the Duke University men's basketball team to be inducted as a player, thanked Krzyzewski, his college coach from 1988 to 1992. "I came to you with a dream, and you gave me the blueprint," Hill said. 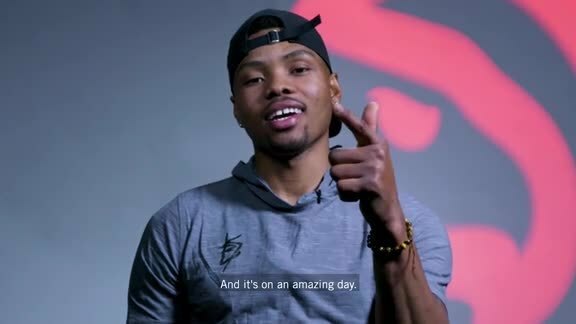 "I learned how to lead, how to win, how to compete, how to play together as a unit -- and even how to slap the floor when I'm playing defense. Of course, how to be a champion. But most importantly, you taught me to believe in myself." Hill also addressed Patrick Ewing, who starred at Georgetown University while Hill was growing up in nearby Reston, VA.
"I fell in love with the game of basketball watching you dominate in both college and the NBA," he said of Ewing. "Your intensity -- combined with your stellar play -- it inspired me to dream, to dream that I could one day play at the highest level." 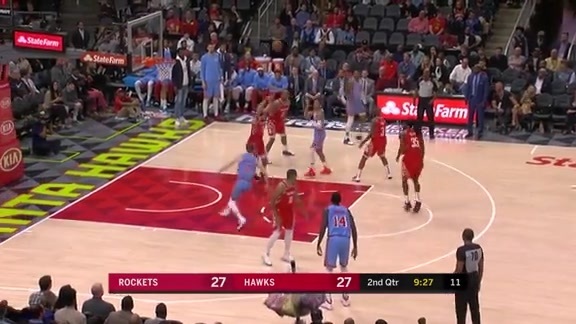 Hill also expressed heartfelt gratitude to his wife, Tamia, his daughters Myla and Lael, his former teammates and coaches, his childhood influences in Reston, the medical staffs who helped him play basketball, and his co-workers at both Turner Broadcasting and the Atlanta Hawks. Hill also thanked the players who came before him. "I have tried to always honor and respect the legacies of the men and women who paved the way," Hill said, "many of whom are in the Hall of Fame and in this building here tonight. I'd like to thank all of you for your significant contributions to the game, for your sacrifices, and for allowing us, the Hall of Fame Class of 2018, to stand on your shoulders as we pursued our dreams on our respective journeys." Fully enshrined, Hill now becomes one of the Hall's members on whose metaphorical shoulders others will stand, including those of his alma mater. "I might be the first Duke ballplayer in the Hall of Fame, but I can promise you that I won't be the last."